See How She Runs: How do you like your Brussels Sprouts? Last week I bought a huge bag of Brussels Sprouts. They were a good deal, and I knew it would give me an opportunity to play in the kitchen. Last night I experiments with Ina Garten's recipe for roasted Brussels Sprouts. I only used half of the olive oil that was recommended...(but they still seemed a bit too oily for me). They turned out decent, but not as yummy as I had hoped. In the past, I have only steamed my sprouts and thought they were tasty, but I want more options. How do you prepare your Brussels Sprouts? Or do you like them at all? I brought some for the first time this week and tried cooking them. I put olive oil in a frying pan (or whatever you call it in America, the big flat low pan I use to fry my eggs lol), cut the bs in half, laid them flat down. Covered them with salt and pepper and cooked for 2-3 minutes. Then I added a cup of water and covered the pan and cooked for 15 minutes. Tasted great. This is my favorite way to eat them and honestly i could eat them ever single day like this! I also sub out the grapes for cranberries and it is so good!! Cut in half, then tossed with some liquid smoke (just enough to taste - about 2 tbsp. per 10 sprouts [or 20 halves]). Roast at 400º for 8-10 min per side ... ah-mazing! I actually just bought some at the store to make for dinner! I cook mine in the skillet over medium heat with oil and whatever herbs and spices sound good at the time. I don't measure anything or pay attention to the time, but I can tell you that they take a darn long time to cook. Caulifower mashed potatoes and now brussel sprouts..lol..keep the ideas coming! I have never tried a brussel sprout but guess who is gonna buy some this weekend?? We love brussel sprouts but I have only ever steamed them then spray butter and salt and pepper. If you do fins a better way I would love to know! I have no idea.....I have bad memories from childhood. I used to sit at the table forever, because I refused to eat them. I also like them with with bacon! i always cut them in half and drizzle with oil. then i cut the top off a head of garlic (yes a whole head) and bake it on a cookie sheet with the brussel sprouts. then i squeeze out the soft roasted garlic and stir it up in the brussel sprouts. soooo good! 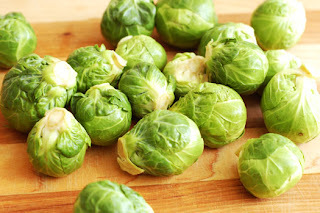 I've never had brussels sprouts before but I'd like to try 'em! Let me know if you find a tasty way to make them.